While trotting along the Valley Trail one sunny, but chilly, afternoon, I found myself hypnotized by a fresh blanket of snow that enveloped the woods. As I walked the trail, the ground and branches all around me glittered and sparkled in the afternoon sunlight like something out of a fairy tale. I find that so many of my fellow New Yorkers dread these chilly months and wish them away, but there’s nothing more magical than being out in the woods after a fresh snowfall. The snow has a special way of hushing the woods into a muffled silence and stillness accompanied only by the sound of a chittering squirrel or the cheering of a chickadee. Not only is there amazing beauty in our “marshmallow world,” but wonder can be found even in a single snow crystal. During our Nature In the City first grade Snowflake Bentley program, students get to make snowflake catchers and take a closer look at these amazing jewels, but I feel compelled, as Wilson A. Bentley was (the first person to photograph a snow crystal in 1885), to explore farther and discover what it takes to make a single snowflake. A picture of a branched snow crystals clinging to a piece of fabric. The story of the snowflake begins exactly where you would expect, way up high in the cold winter clouds. Drifting within these clouds are microscopic particles; things like pollen, bacteria, soil, ash, and salt. 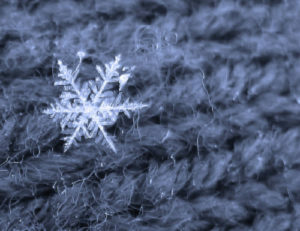 These tiny particles act as seeds upon which a snowflake will form. As water vapor sticks to this “seed” it coats and freezes, coats and freezes, building upon itself, branching and growing until the final master piece falls from the cloud and begins its long journey to the ground. These tiny works of art can be shaped like stars, plates, and even columns! 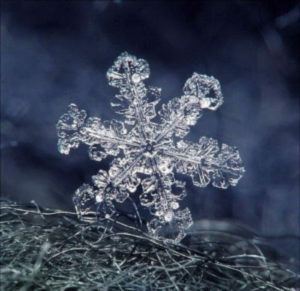 The six-sided symmetry that’s seen in a snowflake is a reflection of the six-sided nature of the bonds between water molecules. While not “impossible,” it’s highly improbable to find two snowflakes that are identical because so many things can influence a snowflake’s appearance. Factors such as air moisture and temperature during a snowflake’s journey down to earth can make it so even the branches on a single flake may vary between each other. The moment those snowflakes touch the ground their beautiful branches quickly begin to break down and degrade. This means the best snowflakes to look at are the ones that are fresh from the sky and haven’t even hit the ground yet. We make snowflake catchers with the students to help them look at the flakes. They do this by gluing a piece of black felt to a piece of cardboard matching in size. The black color provides contrast so you can see all the wondrous details in a single snowflake and since we’re not using our gloves or hands the flakes don’t melt as quickly. What a site to see, whole 1st grade classes, lined up oohing and aahing at the beautiful crystals and the way they shimmer in the sun. Take a moment yourself to find the splendor of snow. Stop by and borrow a pair of our snowshoes this week while the snow is still thick and fluffy to experience the quiet shimmering magic of our winter trails. Or make snowflake catchers with your family and wait for the next snow fall to go outside and admire the beauty that lies within each unique crystal. Cassino, Mark, and Jon Nelson. 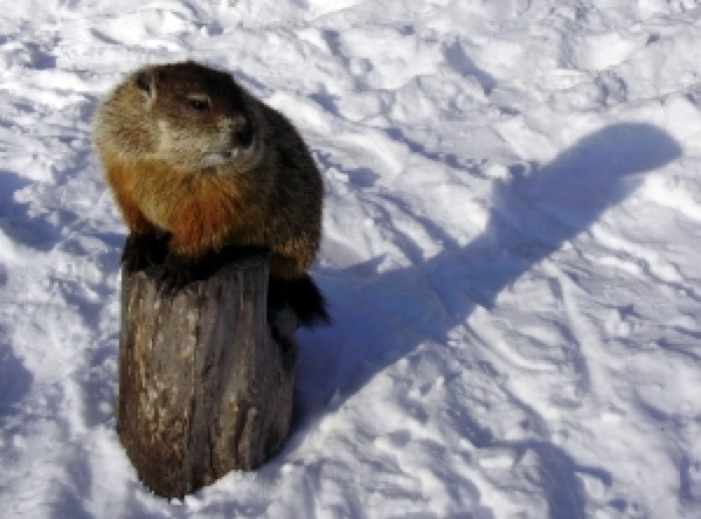 The Story of Snow: The Science of Winter’s Wonder. San Francisco: Chronicle, 2009. Print. 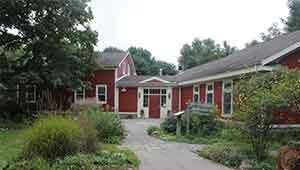 “Snowflake Bentley Biography.” The Official Snowflake Bentley Web Site Owned and Operated by the Jericho Historical Society Jericho, Vermont Hometown of Wilson A. Bentley. Web. 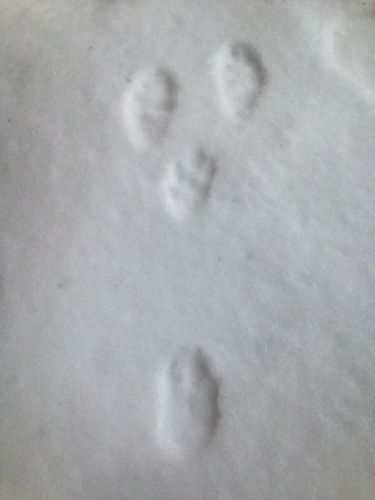 28 Jan. 2015. <http://snowflakebentley.com/bio.htm>.